As I look over the list of activities and events that we update you on this week, I notice that the reports come from so many different places. When you check the various links (and see the note below concerning links) you can read about a convention we just held in Ghana, a report of a camp in the Rocky Mountains, a festival in the Philippines and a Ministerial conference in New Zealand. The sun literally never set on these activities. It is always exciting to see the different ways our International church seizes opportunities to reflect the life and love of God, both within our own fellowship and out to the wider world. I think this is a powerful reminder that God is the God of all human kind, whoever and wherever they are. It is our privilege to be among those who represent him and reflect his love – worldwide, 24/7. 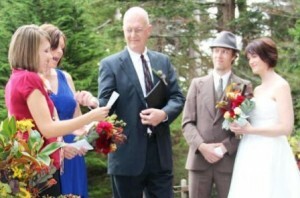 Ted Johnston (center) conducts wedding of Joe and Carey (at right, with Ted’s daughter Traci Calvert at left). One of the ways we experience and express God’s life and love is in the bonds of marriage. 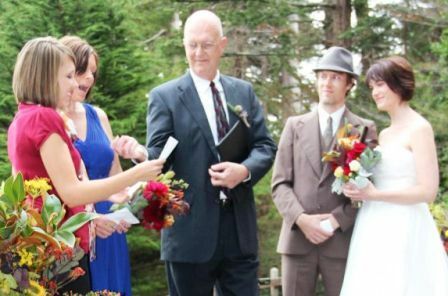 Ted Johnston, who serves on the U.S. Ministry Development Team and also coordinates production of GCI Weekly Update, recently officiated at the wedding of his son Joe Johnston to Carey (Graeff) Johnston. The couple, who live and work in San Francisco, were married recently on the Pacific coast near Gualala, CA. Congratulations to Ted and his wife Donna and to Joe and Carey! I pray that you experience God’s rich blessings of love in your family relationships, and if some of those relationships are fractured, that you will experience God’s gift of reconciliation. Please note: The GCI Weekly Update email is sent to all U.S. pastors, and mission developers and national directors outside the U.S. Those whose email systems disallow active (hot) links, can access the full content of each issue (including my letter) at https://update.gci.org/. As you know, I often close my Weekly Update letter with the reminder that prayer is the battleground where we fight the good fight of faith. It is through prayer – both individually and corporately – that we go forward, together. There are many ways to pray of course, but not many of them are in tune with what Christian prayer is all about. There is an old saying that goes, “Moses supposes his toeses are roses, but Moses supposes amiss.” Just the fact that we believe something or have always done something in a certain way, does not make that thing true or right. Many prayers are focused on people’s selfish wants and desires, not on the things God has shown us are important. How many people pray for the fruit of the Spirit, for example. How many people pray for the welfare and blessing of their enemies? How many prayers are focused primarily on giving thanks? On the other hand, how many prayers are focused on winning a game, winning a lottery prize, getting the car or house we have our eye on, or on getting someone else to do or see things our way? The Bible says, “When you ask, you do not receive, because you ask with wrong motives, that you may spend what you get on your pleasures” (James 4:3). The kinds of prayers that Christians pray have to do with Jesus command that we love one another (John 13:34-35). We pray for not merely for things, but for one another, because the primary thing Jesus has given us to do as his disciples is to care about, build up, encourage, strengthen, forgive, serve, and in any other way we can, to love one another. That is why our prayers are focused on seeking God’s will, because God’s will is that we love one another. Through prayer, we listen to God as well as talk with God. In prayer our hearts and minds are intertwined with his, allowing us to discern more clearly his will and purpose. A good way to pray is to pray through a passage, listening to what God may have to say to us through the passage and talking to him about it. Using the prayer requests and updates in this publication is one way we can pray for one another, which strengthens our relationships with each other in Jesus. It is another way we can participate in his command that we love one another. I am so grateful for the concern and love that all of you have for your brothers and sisters around the world, and I know that translates into much prayer. In addition to the prayer requests in the Weekly Update, we can also read stories about the many things God is doing in our fellowship around the world, then take what we learn to God in thanksgiving for his continuing guidance and ongoing provision. It is a way to participate together in what God is doing throughout the world, and more than that, it is a concrete way that we can take part in the love for one another that Jesus wants us to have. As we learn more about our brothers and sisters around the world we have opportunity to give thanks for the many gifts that he bestows on his children. One of those gifts is the gift of music that God has given to Juan Carlos, the son of Hector Barrero, our national director in Columbia. To listen to a song that was written and performed by this talented young man, go to http://www.youtube.com/user/IIIBARREROIII#p/a/u/0/G_QCrf0MdBs. Until next time, may you and your family hear and dance to the music of God’s grace! Have you ever watched a TV advertisement for a product that seems so amazing and the price so cheap that it seems just too good to be true? At first you’re probably skeptical, but as you listen to testimonial after testimonial from perfectly credible sounding people, you begin to believe that this might indeed be a miracle product – the very thing you’ve been waiting for, whether you knew it or not. And it gets better – the price is just a fraction of what you would spend on similar products that don’t work as well. But wait – there’s more! If you call within the next five minutes you’ll get not one – not two – but three bonus gifts that are alone worth the purchase price. Operators are standing by, but supplies are limited, so you MUST ACT NOW! So you succumb and place an order. But when the item arrives you are deeply disappointed. It looks and works very differently from what you saw displayed under the bright lights of a TV studio. With a sigh you realize you have been tricked by slick advertising that greatly oversold the item. It leaves you feeling foolish and betrayed, and you resolve never to fall for that kind of deception again. It’s bad enough if that happens with a vacuum cleaner or a piece of jewelry. But it is tragic if untruthful advertising misrepresents something as important as the gospel. But sadly, it does happen. The gospel is good news, the best possible news anyone can hear. It promises a new life beyond death, a life rich in joy, peace, friendship and real love. It’s the good news of a life in communion with God, who loves you and wants you with him no matter who you are, where you’ve been or what you’ve done. The gospel is the best and only hope for humanity. It is the best and only hope for you and me and everyone we care about. That is why we preach it, calling on all people everywhere, as far as the Spirit gives us opportunity, to turn to Jesus in faith so they can know Jesus and know the Father for who they really are, as well as so they can come to know themselves for the beloved children of the Father they really are in Jesus. My deepest thanks goes out to all of you for all you do to help spread this best of all good news! 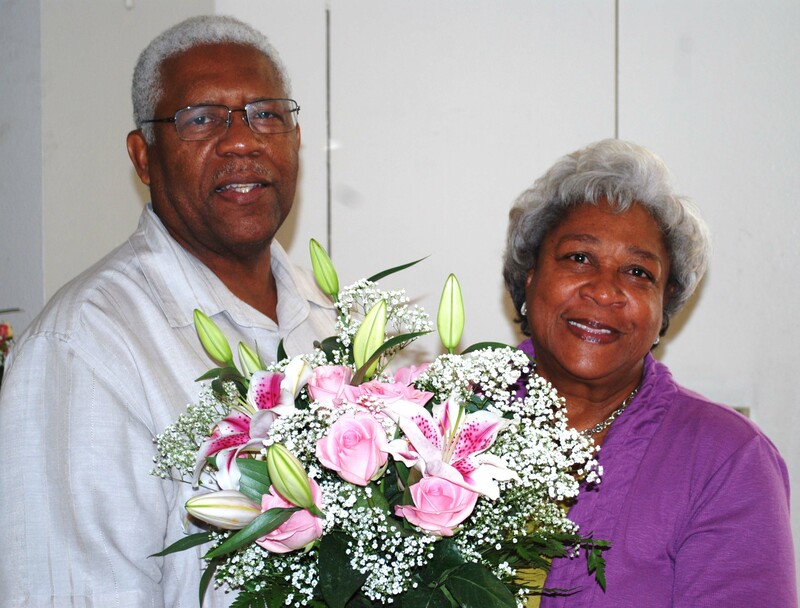 This week we’re pleased to honor Franklin and Cora Guice who recently celebrated their golden wedding anniversary. Franklin is a GCI elder who has served on the Church’s board of directors for many years. He and Cora are active servants at our New Hope Christian Fellowship in Eagle Rock, California. Our thanks to them for their faithful example, and our deepest congratulations to them for their fifty years of marriage! I’d also like to draw your attention to two reports from two widely separated areas of our worldwide work. Hector Barrero sends us news from our churches in Chile and Argentina. Kalengule Kaoma, our Mission Developer in Africa, brings us news from one of our most remote and inaccessible congregations in the Democratic Republic of Congo. I hope you will take the time to download these two stories and share them with your congregations. It is easy for us to think of God’s work only in terms of our local area. These exciting reports from ‘the uttermost parts of the earth are a reminder that the Holy Spirit is at work in our denomination 24/7. Here in the United States, political campaigns are gathering momentum in preparation for the November 2012 presidential election. Churches are tempted to choose sides and get involved in the politicking and infighting. And we all have opinions. However, it is very important that we remember denominational and congregational leadership within GCI is non-political. This is not just our decision – there are strict laws legislating what non-profit organizations can and cannot do. I have asked our Legal Department to prepare a thorough briefing concerning this policy. Please click here to read an important legal briefing concerning this policy from the GCI Legal Department. Please make a point of reading this without delay. As Christians, we are expected to be concerned about the way we are governed. But we should express our concerns and opinions in prayer, as several places in the New Testament remind us. There are important political changes happening all around the world at this time. We should ask God to direct these choices so that his agenda to spread the gospel in all nations is advanced. Remember, a quiet word of prayer can accomplish more than hours of angry argument. So let’s pray that God will direct the political process so that the agenda of his Kingdom can be advanced. In this week’s Update, I have included a report from the Director of our Heartland Summer Camp, and also news of a community outreach in Denver. Daniel Boesch has sent us news about the Annual Festival in Ferrara, Italy. I was encouraged to see how our Italian church is growing slowly but steadily. After 37 years of ministry, one of our pastors in Montreal, Dennis Lawrence is having to go on Disability leave for the foreseeable future. His congregation held a celebration of his life and work. To round things out this week we have some tips for developing leaders by Bob Logan, and news of a new Master’s Program in the Philippines. To see any of these stories, just click on the links. If you are having difficulty using this new way of presenting the Weekly Update would you let us know. I want it to be a truly useful vehicle for letting you all know what is going on in our truly International Fellowship. Until next time, blessings and love from my family to yours. I praise God daily for the many ways our churches are actively and creatively participating in the life of God in the world. In conferences this year, we have been emphasizing how God reaches out in love to all humanity, revealing himself and declaring the salvation that he has secured for all people in Jesus Christ. And the beautiful thing is that God calls us to share in that with him. Using Bible terminology, we call our part in that work “mission,” and that mission is trinitarian and incarnational. We call it trinitarian because it is from the Father, in the Son, through the Holy Spirit. We call it incarnational because it is being worked out in exciting ways through the Spirit by the Son who is present in his Body, the church. The church is formed, gifted and empowered by the Holy Spirit to participate in what God is doing to draw all people into Christ and his loving relationship with the Father. As part of Body of Christ in the world, we are privileged to participate in what God is now doing in the world. In this issue of Weekly Update we take a look at some of the ways our members and congregations are taking part. Our congregation in Kalispell, MT is hosting a community garden that demonstrates God’s love by benefitting a local food bank. Two of our U.S. pastors joined with our Caribbean mission developer on a mission trip to Haiti. One of our U.S. couples led a mission trip to Africa. Several of our Philippine pastors gathered for a conference in Mindanao to learn more about their part in God’s mission. New Heights Summer Camp is taking steps to equip staffers and campers for active participation in the mission of God back home. My sincere thanks to all our members and congregations for the sacrifices they make every day to participate actively in what God is doing in his mission to our world. That participation always begins with and goes forward in prayer so let us remember that prayer is the battleground where we are fighting the good fight of faith. It is hard to believe that it has been 10 years since that awful day we remember as 9/11. All of us old enough to have experienced it remember where we were and what we were doing as the tragic events unfolded. On that fateful morning, the World Trade Center Towers had been destroyed, the Pentagon had been attacked, and another airliner with many passengers had crashed in a field in Pennsylvania. Nearly 3,000 innocent people lost their lives in these coordinated and brutal acts of terrorism. And many more thousands were left grieving the loss of their loved ones – emotional scars they still bear to this day. However, this Sunday the horrors of 9/11 will not be a distant memory for many thousands of people. So I want to ask our congregations to be sure to remember them in our prayers this weekend. And if you, personally, know someone who lost a loved one, or whose life was shattered by those events ten years ago, why not call them, or send them a personal note? Let them know that they are not forgotten and that you are praying for them. In the last Weekly Update, I noted the destruction caused by Hurricane Irene. We learned this week that some of our members in the U.S. experienced significant damage to their homes. Among them were GCI Pastor Al Nelson and his wife Arlene, who live in Vermont. Irene left 17 inches of water standing on the first floor of their home. Also, two of their vehicles were destroyed. Insurance covers the vehicles but not the house. They are seeking financial help through FEMA. Al’s brothers are helping him rebuild. Al figures that the house won’t be back to normal for six months. In the meantime, he presses on in serving the congregation that he pastors. Please pray for Al and Arlene and others affected by this tragedy. In this issue, we share exciting news about our new church plant in Los Angeles. We also feature a video of a discussion I had with Dan Rogers concerning the importance of church planting for GCI. Also check out reports on the 50th anniversary of our Elkhart, IN congregation, the commissioning of John Pairitz as the new senior pastor in our Michigan City, IN congregation, and the Caribbean Women’s Conference. Let us, in prayer, fight together the good fight of faith. Please join me in praying for several mentioned this week (see the links under Prayer and Updates). Hurricane Irene has left a long trail of destruction and death through the Caribbean and along the U.S. East coast into Canada. Initial reports from Charles Fleming indicate that our members in Haiti and the Bahamas suffered only minimal damage, and so far our U.S. district pastors are reporting that our members along the East Coast were also spared the worst, though some members had to evacuate their homes, and are experiencing continuing power outages. We are united in support and prayer for all those affected by the storm who are grieving the death of loved ones and enduring the loss of property. Even in the midst of tragedy and pain, life moves on. This week we celebrate with Scott and Barbara Wertz the birth of their first grandchild (Scott is a long time employee in our Glendora home office) and rejoice in milestone anniversaries of our Exeter, England and Salt Lake City, Utah churches. Once again we’re reminded that life continually brings both tragedy and celebration. In both, we look to God’s promises to use all of life’s circumstances for our ultimate good. Remember that prayer is the battleground where we fight the good fight of faith. We hope you enjoy our new Weekly Update. We continue to make improvements based upon your suggestions, including the new archives feature, which makes it easy to find past articles (see the link above). Thanks for the suggestions. We email Weekly Update to our pastors in the U.S., and our Mission Developers and National Directors elsewhere. We encourage them individually to forward the email to others. Weekly Update can then be viewed by all at update.gci.org/. You may wish to link that site on your social media (such as FaceBook). Let’s share the good news of what God is doing! A report on a new GCI satellite church being started in Los Angeles. A follow-up video about our new churches in Mozambique. Updates concerning our youth camps in Tennessee and Eastern Canada. An announcement about the See You at the Pole youth prayer gathering. A helpful feature concerning a cross-generational approach to youth ministry. A prayer update on Marj Friddle and a new prayer request for John and Naomi Biswas who, with Rand Holm, were in a multi-car accident (thankfully, they all are OK!). May you realize God’s blessings! And remember that prayer is the battleground where we fight the good fight of faith. Last week I was in Ottawa, Canada, for two conferences. Pastor Bill Rabey did a super job coordinating both. First was the International Mission Developers’ Conference, attended by 25 elders and wives from Asia, Africa, Australia, Europe, North and South America (see picture below). We discussed the advance of the gospel through GCI in many nations of the world. Following that was the Canadian National Conference for pastors and elders and spouses. It was led by Canadian director Gary Moore and included presentations on Trinitarian Theology from Dr. Elmer Colyer (his presentations will eventually be placed on our website). In a church service after the conference, we ordained Fraser Henderson as an elder. It was particularly special because his parents, who had attended the Canadian conference, were present. A very moving video that tells the story of the 87 congregations in Mozambique, Africa that have recently affiliated with us. Reports from GCI Generations Ministries camps in North Carolina and Louisiana. Information about the commissioning of a new GCI pastor in the Philippines. The launch of a new website for GCI Church Multiplication Ministries. We have a number of urgent prayer requests this week. First, please pray for the family and friends of Angelica Recendiz. Her son Hector Espinoza, who committed his life to Christ at our Southern California camp, was killed a few days ago in a gang-related shooting (click here for details). Please also pray for the friends and family of Fred Bailey, one of our retired pastors. I was saddened to learn of his death (click here for details). And please pray for Marj Friddle, wife of retired pastor Jim Friddle. Marj entered the hospital this week to be treated for colon cancer (click here for details). Also click here for a corrected address for Jana (Kissee) Jones (we’re praying for her healing from thyroid cancer). You’ll note in some of the posts that comments appear from Weekly Update readers. You may comment on any of the posts by using the “ADD A COMMENT” feature below each one. Comments are posted at the discretion of the moderator. To comment on my cover letter, click on the letter heading at the top of the page. That will take you to the Weekly Update blog, where comments may be posted. Let us join in prayer with those who grieve and suffer, as well as with those who rejoice. And let us pray for God’s direction and power in all aspects of the gospel work to which we are called. Remember that prayer is the battleground where we fight the good fight of faith. The current version of this update is available online at update.gci.org where you may view and print the update.